“The robotics revolution just shifted into high gear. 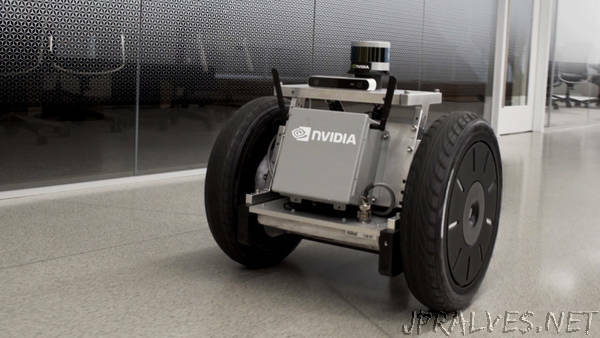 In a move that will accelerate the development and deployment of robotics across a broad range of industries, NVIDIA announced the expansion of its Isaac platform to build robotics applications. Unveiled at the GPU Technology Conference by NVIDIA founder and CEO Jensen Huang, the Isaac software development kit is a collection of libraries, drivers, APIs and other tools. The SDK will save manufacturers, researchers, startups and developers hundreds of hours by making it easy to add AI into next-generation robots for perception, navigation and manipulation. It also provides a framework to manage communications and transfer data within the robot architecture. And it makes it easy to add sensors, manage sensor data and control actuators in real time. Part of the SDK is Isaac Sim, a simulation environment for developing, testing and training autonomous machines in the virtual world. The algorithms trained in simulation are then deployed to NVIDIA Jetson for AI computing at the edge, bringing robots to life. NVIDIA also showed off the first reference design based on the Isaac SDK, dubbed Carter — for its handy ability to cart around objects. The delivery robot is onsite this week in the NVIDIA booth at GTC’s Exhibition Hall. The robotics field presents nearly unlimited opportunities — but training and testing of physical robots can be costly, time consuming and, in some cases, dangerous. NVIDIA’s Isaac Sim, an evolution of our Isaac Lab, lets developers train and test autonomous machines created with the Isaac SDK, in detailed, highly realistic scenarios. This is done using a suite of development tools for high-fidelity simulation and advanced real-time rendering. Isaac Sim is tightly coupled to the tools and framework present in the Isaac SDK, enabling the seamless transfer of data and algorithms to and from the physical robot — which is vital for accelerating robot development at warp speed. Engineering and testing that would normally take months can be done in minutes. Once a simulation is complete, the trained system (brain) can be transferred to physical robots. Jetson combined with the Isaac SDK and Isaac Sim makes the NVIDIA Isaac platform ideal for developing and deploying robotic applications in manufacturing, logistics, delivery, agriculture, service, construction, inspection and other areas. Developers can register for early access to the Isaac SDK at http://nvda.ws/2IHpIoq.